Purpose: The aim of this study was to classify bilateral breast cancers (BBCs) into two groups according to histopathological or molecular subtypes of the two breast diseases in each patient and to study their characteristics in relation to survival outcomes. Methods: Fifty-six BBC patients were enrolled in the study. They were classified according to whether the two breast diseases were of the same or different histopathological subtypes (defined as S-his or D-his groups) and molecular subtypes (defined as S-mole and D-mole groups). Progression-free survival (PFS), overall survival (OS), and important characteristics were then compared between the groups. Results: We observed that the PFS and OS of the S-mole and D-mole groups failed to reach a significant difference. However, D-his BBC patients enjoyed longer PFS than their S-his counterparts, although the OS was similar. 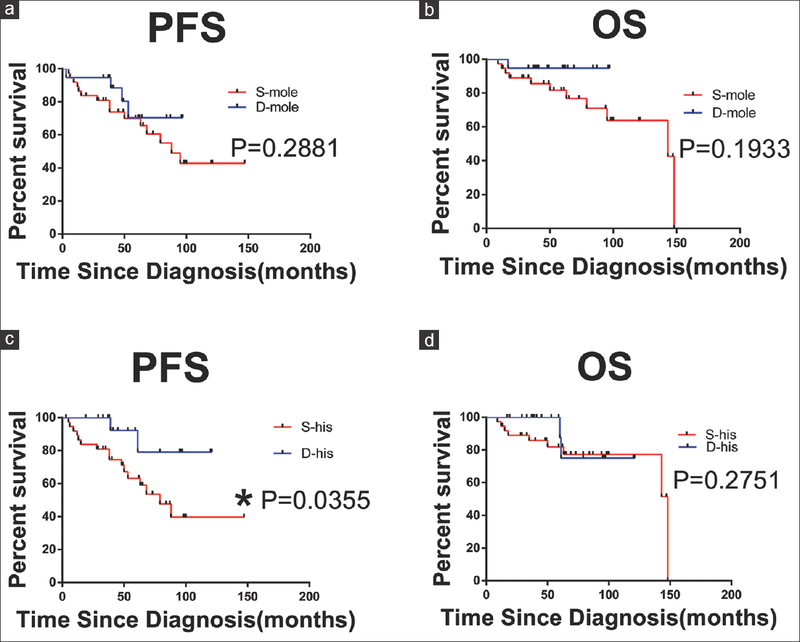 To explore the reason for the extended PFS in D-his BBC patients, we first focused on the possible prognostic contribution by various histopathological subtypes in the groups. We compared the proportion of infiltrating ductal carcinoma, infiltrating lobular carcinoma, and other breast cancer subtypes in the D-his and S-his groups, and demonstrated that they were not associated with longer PFS. We then examined age, menopausal status, tumor, node, and metastasis (TNM) stage, expressions of estrogen receptor (ER), progesterone receptor (PR) and Ki67, and metastasis to lymph nodes, viscera, and bone. The results indicated no significant between-group differences in age, TNM stage, ER/PR expression, and metastasis to viscera and bone. However, significantly lower levels of Ki67and decreased lymph node metastasis rate were associated with D-his BBC patients, which might explain the observed longer PFS. Conclusions: In comparison to S-his, D-his BBC patients had longer PFS, which was associated with lower levels of Ki67 and a decreased lymph node metastasis rate. We first compared progression-free survival (PFS) and OS between the S-his and D-his groups, and also between the S-mole and D-mole cases. There were no statistically significant differences in PFS [Figure 1]a and OS [Figure 1]b between the S-mole and D-mole groups (P = 0.2881 and 0.1933, respectively). However, breast cancer patients with D-his had longer PFS [Figure 1]c than those with S-his (P = 0.0355) although OS [Figure 1]d was similar (P = 0.2751). We discontinued further investigation of BBC based on molecular subtypes (S-mole vs. D-mole) in view of the lack of statistically significant survival differences between them. However, we attempted to unveil the reason for the longer PFS observed in the D-his group. Because breast cancer prognosis is partly dependent on histological subtypes and very different therapy method will be used among ductal carcinoma in situ, infiltrating carcinoma, including infiltrating ductal carcinoma (IDC) and infiltrating lobular carcinoma (ILC), and other subtypes such as mucinous breast cancer. We first hypothesized there might be different proportions of histopathological subtypes in the D-his and S-his groups. One hundred and twelve breast cancers of 56 BBC cases were analyzed, and the result of histological subtype comparison, however, showed no statistically significant difference between the groups (P = 0.208) [Table 1]. Schwentner L, Wolters R, Wischnewsky M, Kreienberg R, Wöckel A. Survival of patients with bilateral versus unilateral breast cancer and impact of guideline adherent adjuvant treatment: A multi-centre cohort study of 5292 patients. Breast 2012;21:171-7. Kollias J, Ellis IO, Elston CW, Blamey RW. Prognostic significance of synchronous and metachronous bilateral breast cancer. World J Surg 2001;25:1117-24. Carmichael AR, Bendall S, Lockerbie L, Prescott R, Bates T. The long-term outcome of synchronous bilateral breast cancer is worse than metachronous or unilateral tumours. Eur J Surg Oncol 2002;28:388-91. Uglyanitsa KN, Nefyodov LI, Brzosko V. The incidence of cancer in the second breast: After radicalremoval of one breast for cancer. JAMA 2000;77:454-7. Abdalla I, Thisted RA, Heimann R. The impact of contralateral breast cancer on the outcome of breast cancer patients treated by mastectomy. Cancer J 2000;6:266-72. Bloom ND, Daluvoy RV, Ceccarelli F, Degenshein GA. Bilateral mammary carcinoma; immunologic implications. N Y State J Med 1980;80:908-10. Chaudary MA, Millis RR, Hoskins EO, Halder M, Bulbrook RD, Cuzick J, et al. Bilateral primary breast cancer: A prospective study of disease incidence. Br J Surg 1984;71:711-4. Jung SP, Lee SK, Kim S, Choi MY, Bae SY, Kim J, et al. Invasive pleomorphic lobular carcinoma of the breast: Clinicopathologic characteristics and prognosis compared with invasive ductal carcinoma. J Breast Cancer 2012;15:313-9. Tang LC, Jin X, Yang HY, He M, Chang H, Shao ZM, et al. Luminal B subtype: A key factor for the worse prognosis of young breast cancer patients in China. BMC Cancer 2015;15:201. Gollamudi SV, Gelman RS, Peiro G, Schneider LJ, Schnitt SJ, Recht A, et al. Breast-conserving therapy for stage I-II synchronous bilateral breast carcinoma. Cancer 1997;79:1362-9. Renz DM, Böttcher J, Baltzer PA, Dietzel M, Vag T, Gajda M, et al. The contralateral synchronous breast carcinoma: A comparison of histology, localization, and magnetic resonance imaging characteristics with the primary index cancer. Breast Cancer Res Treat 2010;120:449-59. Ursaru M, Jari I, Gheorghe L, Naum AG, Scripcariu V, Negru D, et al. Bilateral breast cancer: Diagnosis and prognosis. Rev Med Chir Soc Med Nat Iasi 2016;120:316-20. Chandrika, Permi HS, Kishan Prasad HL, Mohan R, Shetty KJ, Patil C, et al. Synchronous bilateral medullary carcinoma of breast: Is it metastasis or second primary? J Cancer Res Ther 2012;8:129-31. Bajpai J, Punatar SB, Gupta A, Badwe R, Gupta S. Bilateral adenomyoepithelioma of breast. J Cancer Res Ther 2013;9:523-5. Lopez F, Belloc F, Lacombe F, Dumain P, Reiffers J, Bernard P, et al. Modalities of synthesis of ki67 antigen during the stimulation of lymphocytes. Cytometry 1991;12:42-9. Viale G, Giobbie-Hurder A, Regan MM, Coates AS, Mastropasqua MG, Dell'Orto P, et al. Prognostic and predictive value of centrally reviewed ki-67 labeling index in postmenopausal women with endocrine-responsive breast cancer: Results from breast international group trial 1-98 comparing adjuvant tamoxifen with letrozole. J Clin Oncol 2008;26:5569-75. Kilickap S, Kaya Y, Yucel B, Tuncer E, Babacan NA, Elagoz S, et al. Higher ki67 expression is associates with unfavorable prognostic factors and shorter survival in breast cancer. Asian Pac J Cancer Prev 2014;15:1381-5. Tanriverdi O, Meydan N, Barutca S. Reconsideration of clinical and histopathological prognostic factors in breast cancer patients: A single center experience. Asian Pac J Cancer Prev 2014;15:807-12. Narbe U, Bendahl PO, Grabau D, Rydén L, Ingvar C, Fernö M, et al. 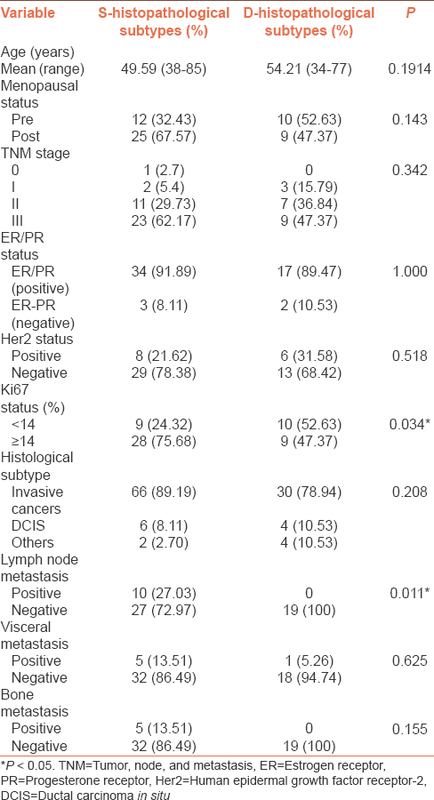 Invasive lobular carcinoma of the breast: Long-term prognostic value of ki67 and histological grade, alone and in combination with estrogen receptor. Springerplus 2014;3:70. Carbognin L, Sperduti I, Brunelli M, Marcolini L, Nortilli R, Pilotto S, et al. Subpopulation treatment effect pattern plot (STEPP) analysis of ki67 assay according to histology: Prognostic relevance for resected early stage 'pure' and 'mixed' lobular breast cancer. J Exp Clin Cancer Res 2016;35:50. Dixon JM, Anderson TJ, Page DL, Lee D, Duffy SW. Infiltrating lobular carcinoma of the breast. Histopathology 1982;6:149-61. Kim JY, Seo HB, Park S, Moon JI, Lee JW, Lee NK, et al. Early-stage invasive ductal carcinoma: Association of tumor apparent diffusion coefficient values with axillary lymph node metastasis. Eur J Radiol 2015;84:2137-43. Shayan R, Achen MG, Stacker SA. Lymphatic vessels in cancer metastasis: Bridging the gaps. Carcinogenesis 2006;27:1729-38. Holm M, Tjønneland A, Balslev E, Kroman N. Prognosis of synchronous bilateral breast cancer: A review and meta-analysis of observational studies. Breast Cancer Res Treat 2014;146:461-75.